The two establishments meet – Tracey Emin and HM The Queen at the official opening of the brand new Turner Contemporary Museum in Margate. 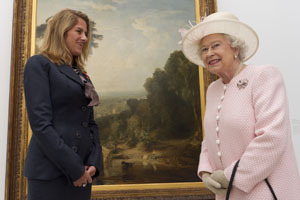 Any royal visit is scrupulously choreographed with places and timings fixed well in advance so Tracey and her mum (out of shot on the left) had plenty of time to get excited as they waited in front of the Turner painting for Her Majesty to come along for an informal chat. They seemed to get on just fine and I didn’t hear the reported gaff a newspaper spoke of. I was concentrating on the light which is great in the galleries that face the sea but not in the one at the back where the two were meeting (I had set up a studio flash on a radio trigger in the corner to bounce off the ceiling but that got shut down – shame) . The architect, David Chipperfield who designed the place was keen to capture the famous Turneresque lighting bouncing off the sea and channel it into the galleries. It puts Margate back on the map and is definitely worth a visit (and so is the chip shop across the road).